At nearly all levels of baseball, the sport's rules state that play shall be halted when lack of visibility poses a safety or playability risk to players or other persons. Last week, college umpire-in-chief William Van Raaphorst turned to a unique experiment to test for fog density during a USC-LMU game. The real-world science lab worked, as visibility was deemed too poor to allow play to continue. The Rule: For reference, NCAA Rule 4-2-b states that "the umpire-in-chief may consult with the game administrator to determine suspension, resumption or termination of play" in the event of "bad weather or unfit conditions [that] prevail during a game." 5-8-c requires the umpire to wait a "reasonable amount of time (not less than 30 minutes)" before calling the game, and uses the delightfully devilish phrase, "any cause that puts patrons or players in peril." In professional baseball, the citation is OBR 5.12(b)(1) for a game in progress ("The umpire-in-chief shall call 'Time' when in his judgment weather, darkness or similar conditions make immediate further play impossible"). Rule 4.03(e) requires the UIC to wait at least 30 minutes after suspending play before calling the game, and allows UIC to "continue the suspension so long as he believes there is any chance to resume play" (in a few years, perhaps the Rule Committee will change it to "so long as the umpire believes..."). NFHS (high school) rules are similar: "'Time shall be called by the umpire and play is suspended when...the umpire considers the weather or ground conditions unfit for play" (5-2-1.b). High school allows an umpire to call the game, rendering it final, after 30 minutes of suspension (unless the game is part of a state series, or other exceptions determined by the local governing body or state). 3) Between Two Games of a Double-Header: Treated like in-game; the umpire has jurisdiction. *College uses "coach and the director of athletics (or rep) of the host institution," while high school uses "home coach," and professional ball uses "home team" (OBR 4.04[a]). ^In pro ball, the umpire-in-chief assumes jurisdiction when he receives the home team's batting order. In NCAA, the umpire is officially in charge of the game upon receipt of both teams' lineups. Seagulls caused a suspended game in 2017. Testing for Fog: As for determining what exactly "any cause that puts patrons or players in peril" (NCAA), "conditions make immediate further play impossible" (OBR), or "unfit for play" means, that's left to umpire discretion. As for how to make such a judgment call, that's similarly up to the umpire. Then again, perhaps some perilous conditions are more obvious than others. Recall the rain and circling seagulls that caused a suspended game in Japan during the 2017 NPB season when umpires deemed the birds too dangerous to allow play to continue. 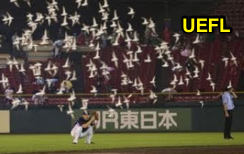 Related Post: NPB Game Suspended After Flock-of-Birds Delay (8/31/17). It just so happened that UIC Van Raaphorst found that the best way to test for fog was to hit a baseball into the sky and see if tracking the ball posed an issue. It evidently did, and the game entered a fog delay, ultimately resulting in termination of play for the rest of the night. Because the game hadn't yet gone the requisite five innings (or 4 1/2 with the home team in the lead), the game was postponed and will be made up at a later date. 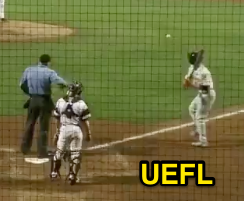 Home plate umpire William Van Raaphorst asks Dillon Paulson to pelt a fly ball to RF to test the fog….